CLASSIC (96–100)/ HIGHEST RECOMMENDATION Cold River Vodka (USA; Maine Distilleries, Freeport, ME); 40% abv, $35. The lovely, austere and enticing bouquet offers scents of black pepper, charcoal and limestone. Entry is sweet and lightly spiced; at midpalate luscious tastes of caramel corn, charcoal, quartz and cocoa bean make for wonderful North American unflavored vodka drinking. Concludes smooth, complex and layered. A coming superstar. Not to get awards confused, but Cold River was also awarded the double Gold Medal at the 2008 San Franisco World Spirits Competition and was chosen “Best American Vodka of 2008” by Winewriter F. Paul Pacult. Anyway, I started the afternoon off right, stopping by Sebago Brewing Company, one of my favorite Portland breweries. I tried their sampler of seven beers currently on tap, which, at $1 per 7 oz pour, it a very real and delicious steal (the Red, India Pale, and Winter Ales were all stunning). The sampler is not on the menu - but is always available. Then I headed north to Cold River. It’s been cold up here in Maine, as you may have heard me say in recent posts. I tried to imagine myself in Russia during the drive. What would a Russian vodka maker think of this concoction? I think they’d probably say, знатных фамилий участвовали в маскарадных шествиях . 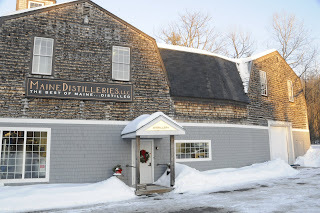 Master Distiller Chris Dowe works out of a gambrel-style building with a retail shop up top and the production facility downstairs in four rooms. It smelled of blueberries because they’d finished a batch of their blueberry vodka that morning. 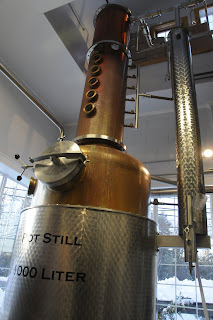 Chris Dowe, Joe Swanson, Chris Mills, and Ben Francis are the sole distillers. It was a quiet day and Ben took me on a short, but educational tour. The numbers he threw my way made my head spin, but I did learn that it takes fifteen pounds of potatoes to make one bottle of vodka. They get their potatoes from Green Thumb Farms in Fryeburg, which is a fourth generation farm. The potatoes are the same high quality potatoes that Mainers put on their dinner plates, but they’re either too large or too small for practical use. Usually too large, says Ben. The farm is also where the water used during dilution is sourced: It is drawn from the aquifer that the Cold River feeds. It takes ten days to make a batch of vodka, which is either 1500 or 2400 bottles (I can’t remember). Cold River is unique in that they are the only vodka producers who use whole potatoes and a copper pot still to produce their vodka. 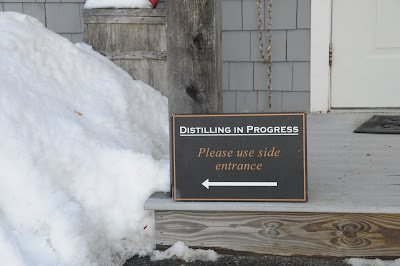 You mean, like you’re the only distillery to do that in Maine, I asked? No, Ben confirmed, the only distillery. Period. The copper is the key ingredient. 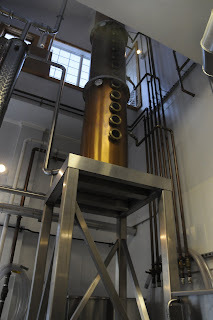 When the vodka is being distilled, the impurities in the vodka naturally attach themselves to the copper, thereby removing themselves from the vodka. Most vodka producers use steel stills, which do not attract and remove such impurities. These producers are then forced to repeatedly filter their vodka. This final process, while removing impurities, also strips to vodka of some its natural flavors. It is similar to filtered vs. unfiltered wines. Using copper does have its down sides: copper needs to be cleaned more regularly than steel, and the still will need to be replaced, as Ben predicted, in like 150 years. But Cold River Vodka retains many of its natural flavors because it is not filtered as much as say, Smirnoff, every drop of which is proudly - for some reason - claimed to passed through seven tons of charcoal. I could certainly taste the difference of Cold River Vodka. It is one of the most flavorful I’ve had. It begins with a potato sweetness before the warm alcohol finish. To make their blueberry vodka, they use Wyman’s Blueberries. Maine is the largest producer of blueberries in the world. I should know, I raked blueberries for Wyman’s growing up. If you want to take your own virtual tour of Cold River, click here.